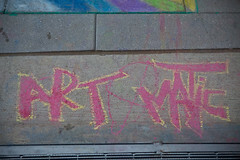 Artomatic Goes Back To School? From the pages of the ANC 6B agenda, set for Wednesday night, comes a potential location for this year’s 10th anniversary Artomatic: Hine Junior High School near Eastern Market. On the corner of 7th & Pennsylvania Ave SE, right opposite from Peregrine Espresso. The property is no longer a part of DCPS, and will be developed by Stanton-EastBanc next year as some office for the Shakespeare Theatre Company. The development will eventually be 510,000 sqft of mixed use office/apartment/retail/restaurant space. This summer fall, though, it will hopefully play host to a collection of amazing artist projects. Ryan Jensen from Peregrine gives us some detail in the comments: If Hine is selected as the site, Artomatic would likely be from Mid October to Mid November, with an epic Halloween party. From talking with the Artomatic folks, if Hine works out it will likely be from mid-October to mid-November with an extra special Halloween party. Needless to say, with over 75k visitors last year the Hill business community is pretty excited about the possibility of hosting Artomatic. This would be amazingly fantastic. speculate all day, but artomatic can’t really announce where they will be until they’ve inked it.